As we have posted earlier, the Samsung Galaxy S6 international variants are already running on the 7.0 Nougat firmware officially. The Odin files are also available for download. The update was a major overhaul for the European countries, which brought a lot of bug fixes and stability improvements to the S6 devices. Today, the Nougat update is rolling out for India and some of the users have already received the OTA. The firmware update comes to us in the form of OTA(Over-The-Air), which can be downloaded from the Software Updates section in About Phone. The Indian variants include S6 (SM-G920I) and S6 edge (SM-G925I). The screenshot confirms of the nougat being pushed to the Indian users. As the Galaxy S6 SM-G920I and the S6 Edge SM-G925I have started receiving the OTA, other variants like Canada (Rogers G920W8), AT&T (G925A), Sprint (G920P), T-Mobile (G920T) and Verizon (G925V) will follow soon. The OTA update weighs around 1.35 GB and brings the Android 7.0 version with it. The latest build number is speculated to be either G925IDVS3EQBG or G920IDVS3EQAC. Once the OTA rolls out to a larger group, we will know for sure. The Nougat build will take your device to the latest security patch level from AOSP. A bunch of Samsung Experience apps are also included. 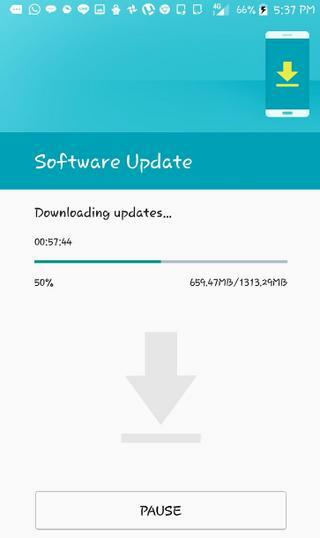 How to update Samsung Galaxy (Edge) to Nougat on Indian variant SM-G925I? The first thing you will need to update the Galaxy S6 to Android 7.0 Nougat is the full stock firmware file. The Odin flashable stock firmware file is not yet available. You can still try to download it using the tool listed here. Once you have the stock firmware file, update the S6/S6 Edge phones to official Nougat by downloading the latest Odin software and install it by adding the .tar file into AP section from Odin tool. See the full tutorial from here. Stay tuned, as we will update the article with the download links once they become available. If you have already received the OTA, tip us so we update the article with the latest build information. still waiting for the downloads links ? Next Entry How to Root Samsung Galaxy S6 (Edge) on official Android 7.0 Nougat firmware?